Rescue the priests of the Imperial clergy from the Daedra. 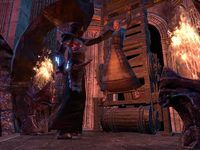 Temple District — Save captured clergy from torture by Molag Bal's minions. The minions of Molag Bal are rounding up the Imperial City's clergy and mercilessly torturing them. The Drake of Blades has asked for my help in rescuing one of these prisoners—a priest named Egnatius. Talk to the Drake of Blades at the Alliance Rally Point in the Temple District. Free the clergy members at the Shrines of Mara, Dibella, and Julianos. Talk to the Drake of Blades in the Temple Rectory. Rescue Father Egnatius from the Temple of the One. Talk to Egnatius in the Temple Hideout. Report to the Drake of Blades in the Alliance Base. The members of the clergy that need to be freed are: Priestess of Dibella, Priest of Julianos, Priest of Mara. The Drake of Blades told me that Egnatius is likely being held prisoner near one of the Temple District's shrines. I should proceed to these shrines and free any captives I find. One of them may be the priest we seek. I freed several priests from the Daedra, but Engatius [sic] was not among them. One of the priests indicated that the Daedra took Egnatius to the Temple of the One. I should reunite with the Drake of Blades and tell her what I've learned. The Drake of Blades told me that we must attack the Temple of the One now to prevent Egnatius from being killed. I should make my way there and rescue him from his Daedric captors. Egnatius appears to have escaped the Temple of the One alive. I should track him down in the southwest corner of the district and speak to him. Finishes quest Egnatius informed me that Molag Bal's servants are looking for information on a scroll he found just prior to the invasion. A scroll that only he can read. I should tell the Drake of Blades what I learned. This page was last modified on 15 November 2018, at 23:13.